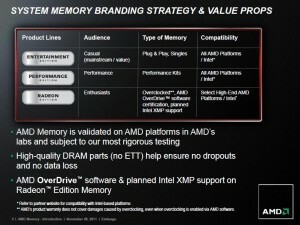 AMD today announced that they will be releasing a line of AMD-branded memory. 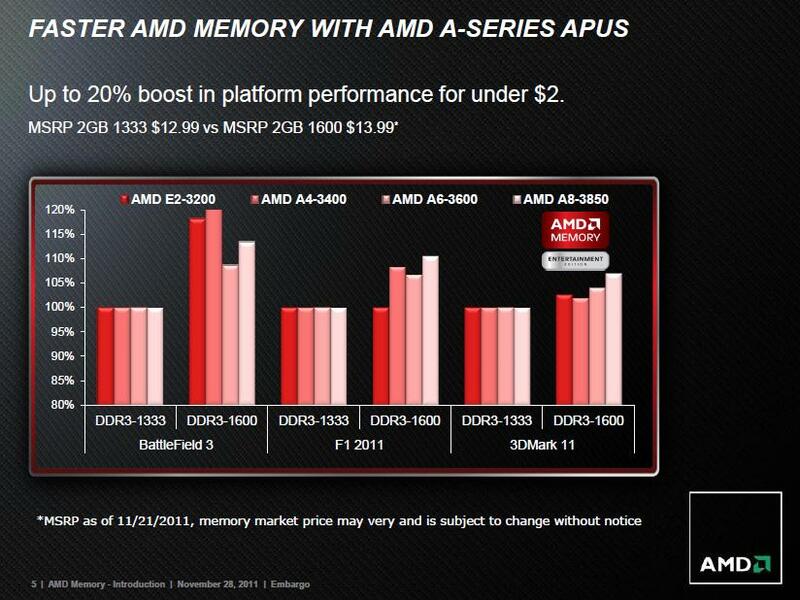 From partners Patriot Memory and VisionTek will come AMD memory ranging from DDR3-1333 to (eventually) DDR3-2133. 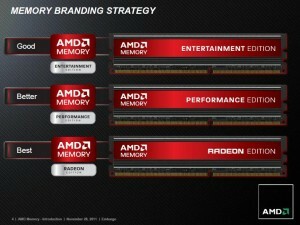 They will have three lines of memory available, Entertainment, Performance and Radeon. It is also equal opportunity memory, with planned support for Intel XMP profiles and compatibility with Intel platforms. 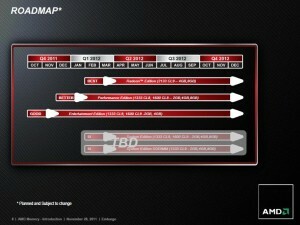 The Performance and Radeon kits will actually be pretty strong in their specifications. The DDR3-1600 kit should have relatively tight latencies of 8-8-8-24. It’s also nice that they’re not hiding the fact that they are using partners to produce it; it will say “Built Buy: [Company]” right on the sticks. They’re not bad looking either. There’s something to be said for simple labeling that isn’t pushing too much bling. One reason they are doing this is to help out with their APUs, which require strong memory since the system memory also serves as the graphics memory. Faster speeds and tight timings help out a lot for their graphics performance. 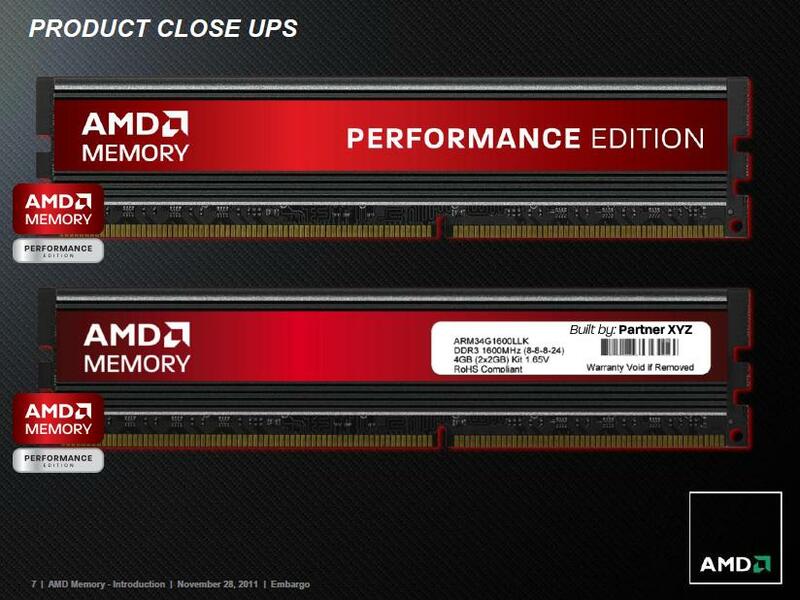 In theory, branding their own memory will help allow them to set the price point, and if they can keep the cost lower than competitors, it will make getting stronger memory for better APU performance more feasible on a budget platform. So, when will this happen? 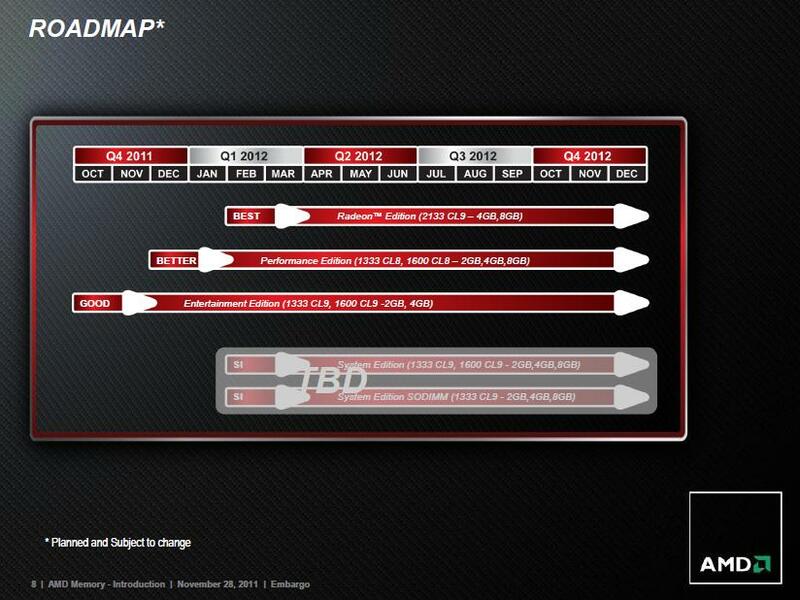 The Entertainment and Performance lines should be available soon, but the Radeon line isn’t expected until late January / early February of 2012. We’re scheduled to have a conference call with AMD later today. If they divulge any new information, this article as well as the accompanying thread will be updated. If you want to see the full press release, it is below in its entirety. introducing DDR3 RAM with major retailers throughout North America. 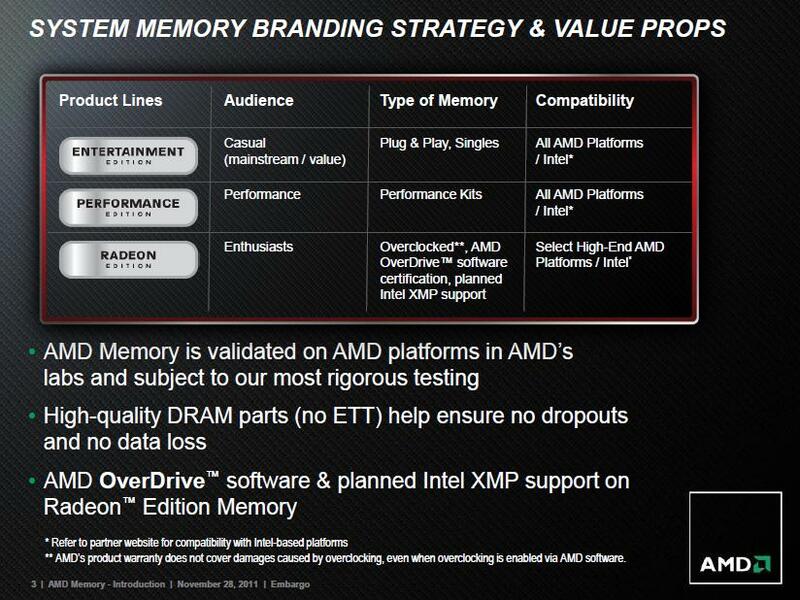 SUNNYVALE, Calif. — Nov. 28, 2011 — AMD (NYSE: AMD) today announced North American retail availability of the first AMD Memory branded desktop system memory modules, debuting with partners Patriot Memory LLC and VisionTek Products, LLC. 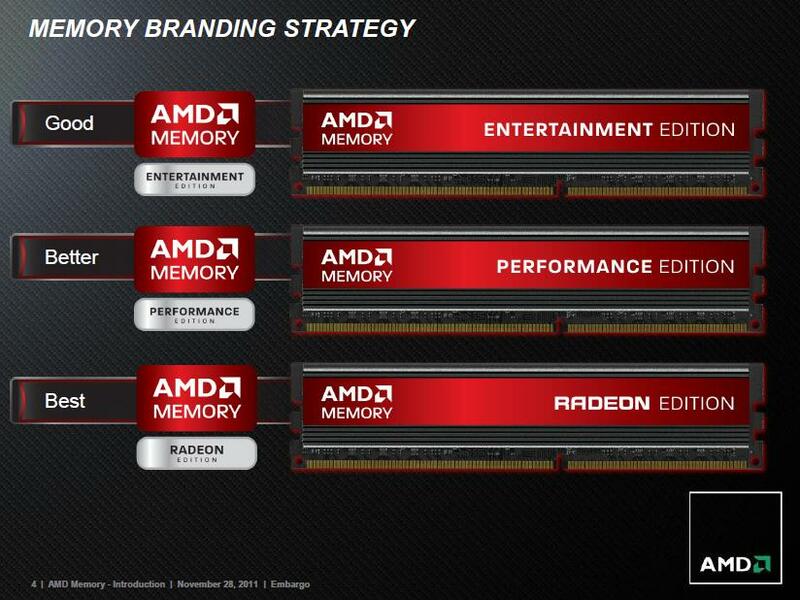 AMD Memory branded products will help take the guesswork out of DRAM selection, providing an easy and straightforward experience when looking for the ideal match for gaming or multimedia PC needs. 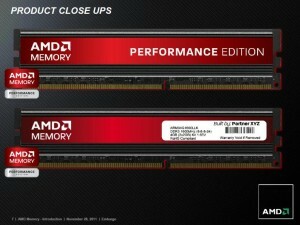 AMD Memory is available at three different levels – 2GB, 4GB and 8GB sizes – in a range of price points and speeds. The Entertainment category will feature 1333 MHz and 1600 MHz speed RAM, designed for quiet Home Theater PC applications. The Performance version supports speed up to 1600 MHz with low latency and comes in matched pairs. Finally, Radeon™ Edition DRAM will run at 1866 MHz, and is tuned, tested and certified for specific AMD platforms to enable maximum performance at competitive pricing. Interesting strategy, not a whole lot of money in the low-end RAM game. I figured that was why OCZ left RAM and focussed more on SSD. I fear they may be pushing it too far with this move. Wouldn't that put them close to having a monopoly with having CPU's, GPU's (and their multi-card technology), and now Memory? Bit of an unexpected move though, at least in my opinion. Doubt it. For CPUs, there's Intel, for GPUs there's Nvidia, and there are tons of other memory manufacturers. Plus this'll work with Intel systems. AMD would need an overpowering majority in those markets and abuse it for this to put them in a bad spot. It looks like they are just trying to put out ram that would take advantage of their APUs. Who are you to judge if it is a good move or not? Well, I must say that on this one, I agree with Sentential. Did you miss the 3 years long Bulldozer winning strategy? You should read again the article. UHHH? This has an AMD label on it but it is not made by AMD. It will not be botched unless there is a flood like happened with HDDs. Does seem a bit strange IMO. Could you ever imagine Intel branded RAM? Try to search the word "bulldozer" in the article. That's what you missed. You also missed another point: AMD shares something near 18% and with the mobile sector growing they need their APU to be competitive. bulldozer strategy=failure. Not talking about the product itself, but about the way they handle their new products and projects. 4 Gigs for $28, which are more or less the price of the PNY166/cas8 on newegg. Yes, they can set their own price (on RAM they are buying from someone else that also sells their RAM at retail) - but it's not like RAM margins are crazy high to begin with. You want lower CAS to help your APU? Buy RAM with the ratings you want from the original binner - not the 3rd party "re-seller". What is new though is 2133 MHZ memory. Awesome! The point is price control. By partnering with 2 RAM manufacturers, they establish greater influence over price points. Through that control/influence, they want to ensure the path is paved for APU platforms which is their fastest growing market. This is the point of the move. Securing that path. @Randyman: If you think they are buying it from someone else, they aren't. The manufacturers make them, and when they come off the line they get a different sticker. What can AMD offer in exchange? Guaranteed premium distribution and increased volume, yielding volume discounts for all parties, and decreased price. Who is paying who? That is anyones guess, but I can say for certain AMD is nearly paying cost for each stick, if not less while the manufacturers make up the difference on volume. The RAM manufacturers are the big winners in the deal, and the payoff from going in together for AMD is greater control in a market they don't directly compete in, which is critical to their future products in their largest growing market. @Randyman: If you think they are buying it from someone else, they aren't. Huh? Patriot manufacures the RAM in their own USA facility last I checked. Patriot will sell to AMD - AMD will sell to retailers. Patriot also sells their own RAM directly to retailers. 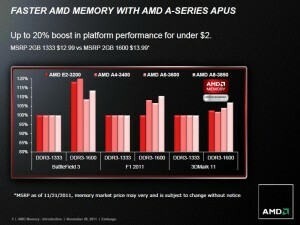 So how is being an extra "middle man" away from the manufacturer going to lower AMD's pricing to Retailers?